Use Simple supplies to investigate the speed of a chemical reaction. Glow sticks are easy to use and kids love them. Correlates to the *Next Generation Science Standards 2nd Grade Benchmarks and K-5 Science and Engineering Practices. Perfect for Halloween or anytime of year. 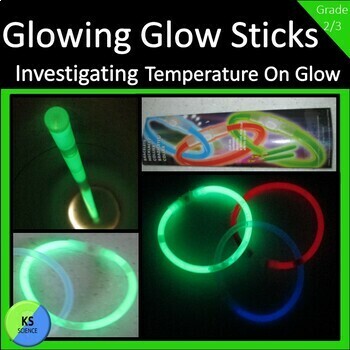 Does the temperature affect the brightness of a glow stick? 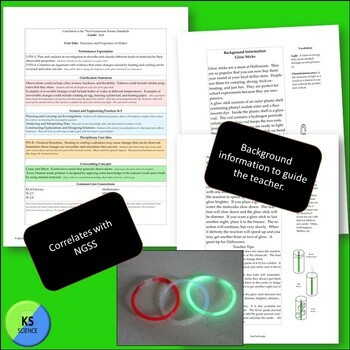 Easy to follow masters, simple materials, and a great way to get kids excited about science. Use for Halloween or anytime of year. *written a hypothesis and supported or unsupported it. *Summarized their data and made a conclusion. * Explain that heat speeds up molecules. *Understand how a glow stick works. Teachers will love its' east of use and students will have a memorable experience. This investigation is part of a series. It is also available for K/1st grade and 4th/5th Grade. 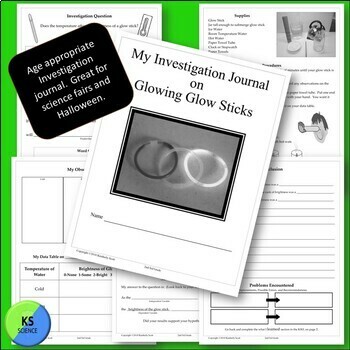 Same great investigation set up to be developmentally appropriate for each level. Click links below. All comments and feedback welcome. Thank you for previewing my journal.